StraighterLine is pleased to announce the launch of a new online associate degree program offered in partnership with Dallas County Community College District (DCCCD). Through the Department of Education’s EQUIP initiative, StraighterLine and Brookhaven College will offer two associate degree programs. Students will also have access – for the first time – to federal financial aid for StraighterLine courses. This innovative program gives you an opportunity to earn an associate degree in either business or criminal justice and to take all of your classes online. 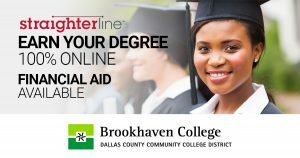 You will take your first year of courses through StraighterLine; you then will be awarded an associate degree from Brookhaven College when you complete the program. The StraighterLine-Brookhaven program also serves as an affordable pathway for students who then want to pursue a bachelor’s degree. We are now accepting applications for this exciting new joint associate degree pathway program at Brookhaven College. Classes start on Aug. 27, 2018. To learn more, visit https://brookhaven.straighterline.com/or to start the application process, give us a call at 877-989-7396.